Half of the packing tasks entails yelling at the top of your lungs (*guilty*), while the other half involves getting some work done. A lot of the work done though is haphazard if you have not done any planning in advance. Not to mention, it can take a couple of attempts before you are sure that the way you have packed your storage unit is correct. Top all of these headaches related to relocating to a new home with the associated energy drain and you may almost want to give up any plans of moving to a new house, city, or country. However, there is always a silver lining, particularly, if you do your packing homework beforehand. Decide what you want to carry to your new house and what to leave behind. Separate items into different categories. For instance, separate the shoes from the clothing items, and the toys from the electronic devices. All these categories demand different packing care, and they will also be packed in separate boxes. Therefore, it is best to start categorizing them from early on. Of course, you can trust your local Bin There Dump That Franchise to assist you in a dumpster rental to help you with the de-cluttering process; we deliver bins across the country that assist homeowners in their relocation process. You will also need a permanent marker for labeling all the packed boxes. Before you rent a container, call the respective business and give an approximate idea of your container load to them. They will then help you to book the container that will best accommodate and comfortably transport your belongings. For instance, ALTA Storage provides containers that are 16 feet in length, 8 feet tall and 7 ½ feet in width. In addition to learning about the size of the portable storage unit, gather details about its material and the facilities that it offers. For example, ask if the container is pest-protected and climate-controlled? If you are transporting items that are sensitive to temperature change, then you might want to learn about the climate-control feature of a container. At the same time, certain container transporters don’t pay attention to pest attacks. However, your stuff is exposed to the risk of a pest infection if the container is placed on the ground. Therefore, ask for all of these details in advance. Once you rent a transportable container, the moving company will transport it to your house on the given date and leave the unit at your doorstep. They will then pick the container up after you have loaded it and take your belongings to your new destination. One crucial factor to take into account here is the space for the container unit. Since containers are spacious, make sure that there is plenty of parking space for them. At the same time, ensure that the container is placed on a flat surface, preferably on the ground, as it can block the sunlight that the grass receives. Ideally, the unit should be as close to your doorstep as possible so that you can easily load and unload items into it. Remember to stack all the heavy items on the bottom of the container. Place the lighter boxes on the heavier items. 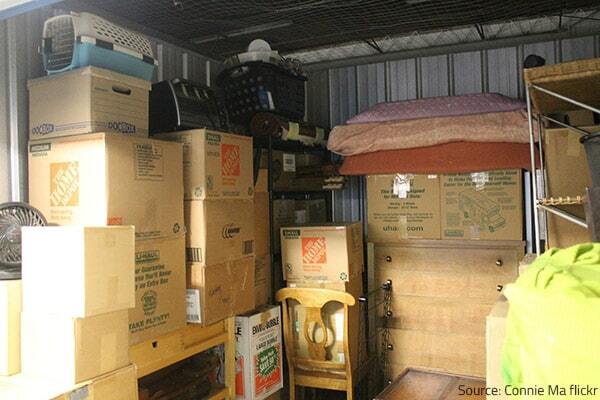 Not to mention, use all the available space in the storage unit from side to side and top to bottom. Don’t place all the heavy items in one area. Instead, evenly distribute the weight of your container load throughout the mobile unit. A simple way to do this is to spread the heavy items on the container’s floor and top them up with lighter weight boxes. Fill in all the space in the container. To this end, mix up the small and large boxes so that there is no room left in between. This will prevent the boxes from shifting when the container is on the move, lowering the odds of damage to your belongings during transportation. Write a list of which of your belongings is present where. This will help you keep a check on all of your items, slashing the odds of losing them. An inventory is, particularly, helpful if you are transporting your belongings in two containers or transporting some of your stuff yourself while the rest goes with the moving services. Moving to a new house does not have to be challenging. With the right planning, proper packing, and reliable moving service providers you can easily relocate to another place without carrying a load of worries on your shoulders.